Last week, at the 2015 NAHB International Builders' Show in Las Vegas, five PA teams triumphed in multiple categories in the Residential Construction Management Competition (RCMC). Four of these PA teams are PBA Endorsed Trade Programs. The NAHB Student Chapter and PBA Endorsed Trade Program at Williamsport Area High School won first place in the High School/Secondary category. The chapter at York County School of Technology placed second in the same category, with Cumberland Perry AVTS winning third. Penn College of Technology two-year team took fourth place, and the four-year team took 12th place in their respective divisions. Penn State University also represented PA well, taking first place in the four-year program. More than 75,000 builders, remodelers, students, faculty members and suppliers packed the aisles at the 2015 International Builders' Show, Design & Construction Week. Fifty-four teams representing universities, community colleges, high schools and career technical schools across the U.S. participated in the annual competition, according to NAHB. "We are very proud of our award-winning Endorsed Trade Programs," says Peter Gallagher, 2015 PBA President. "Particularly with how well they have represented the state of Pennsylvania in this competition. These students work incredibly hard and are very knowledgeable in their fields. They certainly are the future of our workforce." "Congratulations the Pennsylvania NAHB Student Chapters," said Jerry Howard, CEO of NAHB. "They and their competitors showed a great deal of talent along with a depth of understanding of building industry management, from land development to marketing to scheduling to estimating." Howard acted as Master of Ceremonies during the Student Awards Ceremony at the Show. 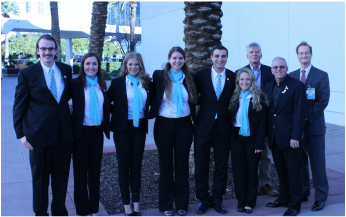 "Students will remember the competition for the rest of their lives," said Bill Faulk, chairman of the High School Competition Committee for the NAHB Student Chapters Advisory Board. "The judges were impressed with this year's group, and we expect once again that the participants will be at the top of the heap when it comes to job offers." The Penn State University team - First place. Pictured with PBA CEO Daniel Durden, 2015 PBA President Peter Gallagher, and 2015 PHRC Committee Chair Paul Laskey. Williamsport Area HS celebrating their first place win.